While many restaurants and bars feature poutine on their menu (even McDonald’s introduced it in the last few months), there’s something to be said for visiting a restaurant that specializes in the ultimate Canadian comfort food. There are tons of different options around Vancouver (pastrami poutine, fried chicken poutine, hot dog poutine, etc…), but if you’re a poutine virgin, you’re best bet is to try some good ol’ fashioned fries, gravy and cheese curds. For your first time, (of many to come–hopefully) there are a few great places to introduce yourself to Canada’s claim to fame. There have been some heated debates on who exactly offers the best poutine in Vancouver, but the answer is all subjective. Here are 5 great places to start on your journey to finding your favourite poutine in Vancouver, because you’ve gotta give yourself some reason to go to the gym! What else could you expect from a restaurant aptly named “the beautiful potato”? There are around 30 different flavours of poutine ready to order, and there is usually a line up of drooling patrons at this Davie Street poutinery. Luckily for vegetarians, the gravy is meat-free at La Belle Patate, so you can avoid having to stare at your friends in envy. Squeaky cheese, delicious gravy, crispy fries. Not much more to ask for! You can even get an All you can eat poutine for just $19.50, think you can handle it? Mean Poutine is a relatively new poutine place in Vancouver that is, quite literally, a hole in the wall. Found on Granville Street and again popular with late night partiers,Mean Poutine is a family-owned business that offers delicious assortments of poutine for around $7 a box. One of their more popular options include a fried chicken poutine, which mixes crispy chicken with their tasty fries, gravy and cheese curds. You’ll have a hard time trying to keep yourself from hitting up their window every night. Nestled on the bustling street of Commercial Drive, Belgian Fries is a favourite among locals who love to stuff themselves with gravy-soaked fries. Often touted as offering the best poutine in Vancouver, Belgian Fries also offers huge portions of the stuff for decent prices. The gravy is vegetarian-friendly again, but if you’re looking for more meat in your meal, you can pack the poutine with pastrami, chicken, pork, or other assorted toppings. A great place to people watch, coupled with some great poutine means that you should probably head there right now. For all the vegans out there, the Wallflower Modern Diner on Main Street has answered your poutine prayers by offering the only (?) vegan poutine in Vancouver. Sure, it’s not quite like the real thing (they use daiya mozzarella cheese), but for vegans out there who are craving some gravy-soaked comfort food, the Wallflower is the answer. Tofu, veggie gravy, and delicious fries… the Wallflower is making poutine almost… healthy!? 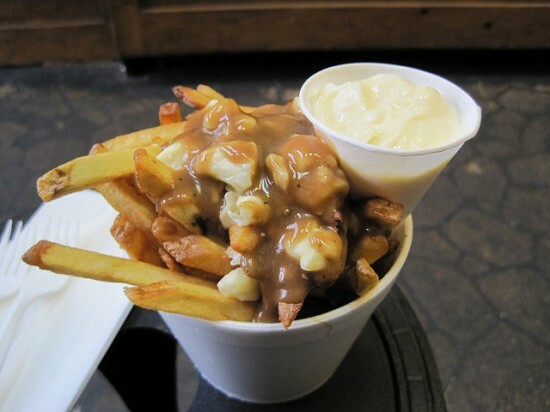 Did we miss your favourite poutine place in Vancouver? 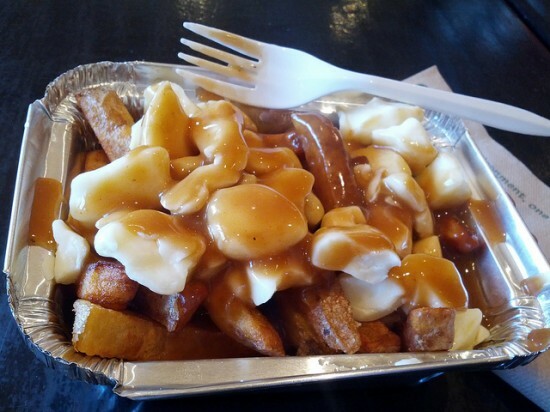 Where do you think is the best place to try poutine for the first time? Let us know in the comment section below!